Nadejda Grinfeld served as Member of the Moldovan Parliament (1917–1918). Sfatul Ţării included only two women, Elena Alistar being the other woman member of Sfatul Ţării. Nadezhda Evgenevna Grinfeld had joined the Odessa, Kiev, and Saint Petersburg. Grinfeld, had already established a reputation as a Bundist speaker in the prerevolutionary period, was the head of a Bundist self-defense group in Odessa during 1905 Russian Revolution. During 1917, she was a popular speaker at mass meetings in Petrograd and Kronstadt. 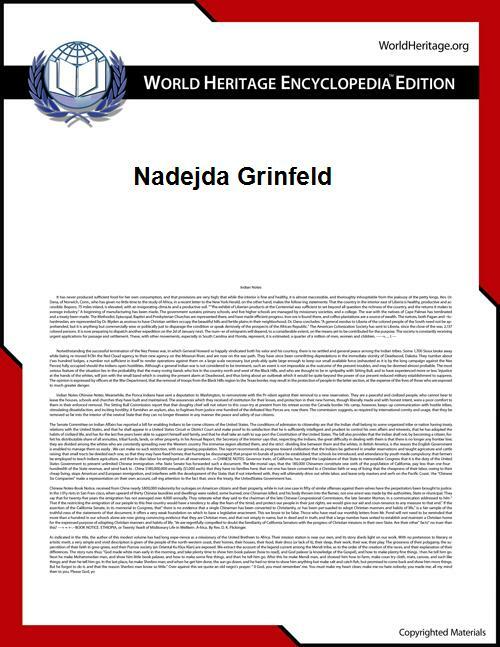 Other names: Nadia (Frume) Kenigshats Grinfeld. Leopold H. Haimson, Ziva Galili y Garcia, Richard Wortman, The making of three Russian revolutionaries: voices from the Menshevik past, 1987.